Written by: admin on April 9, 2014. Innovation is a word that is frequently tossed around the international development sphere. It is a common notion today that if an organization is not innovative, it may lose out to competition. According to the Merriam-Webster dictionary, to be innovative is to “produce a new idea, device, or method.” Many organizations can coin themselves as innovative, sustainable, or impactful. However, The Akshaya Patra Foundation, located in Bangalore, India, truly defines what it means to be innovative by implementing a replicable, sustainable, and measurable social model. 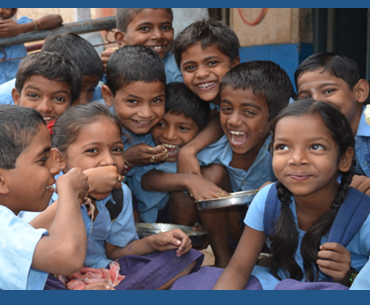 The mission of The Akshaya Patra Foundation is to end classroom hunger amidst government school children by providing mid-day meals; thus providing a strong incentive for students to stay in school and learn as much as possible. The Akshaya Patra Foundation was started when its founder, His Divine Grace A.C. Bhaktivedanta Swami Prabhupaba, witnessed a group of children fighting with street dogs over scraps of food. Incredibly moved by this occurrence, he began laying the groundwork for Akshaya Patra based on the motto: “No child in India shall be deprived of education because of hunger.” Since foundation in 2001, this organization has grown at incredible speeds, being able to reach schools and children across vast areas of India. So what makes The Akshaya Patra Foundation so incredibly unique and impactful? Binali Suhandani of Akshaya Patra declares “The most motivating aspect is the simple reality that technology has an ability to change lives.” It is exactly technology that has allowed this organization to prepare 100,000 meals in less than 5 hours, scaling up to the reach of feeding 1.34 million children in 10,500 schools across 9 states and 21 locations throughout India every single day. It is home-grown, non-patented technology, with sustained local fundraising and strong partnerships that allows this model to be replicated throughout the world. Even Bangladesh and the Philippines have already begun to implement this program into their systems. This innovation technology and model includes 19 large centralized kitchens with advanced cooking technology and minimum human intervention. The cooked meals are distributed through heat-insulated, dust-free special purpose vehicles to the schools. Additionally, Akshaya Patra operates 500 decentralized kitchens in 3 states with the help of local women self-help groups to provide meals to schools in remote areas inaccessible by road. As stated, the mission of Akshaya Patra is to provide mid-day meals to hungry street children. One specific example highlights the importance of student meals to the attendance rates of school children. The town of Madire, India is located in a remote, nearly inaccessible area making it difficult to bring meals. Two years ago, the school had less than 50% attendance every day, mostly due to a lack of healthy lunches. One teacher, Vidya, noted that “Their [the students] hungry stomachs would reduce their strength and capacity to understand. By afternoon they would become so weak that they would go back home for lunch and never return.” However, village members got word about the incredible results of Akshaya Patra, and requested services to the local schools. Nearly eleven months later after implementing Akshaya Patra’s services, the attendance rate of students in Madire has been on a rise to almost 80-85%. In the case of Akshaya Patra, numbers don’t lie. The amazing work by Akshaya Patra has ranked them as number 23 among the Top 100 NGOs of the World by The Global Journal 2013. The attendance rate of students through this program has increased from 71.5 percent in 2005-2006 to 89.4 percent in 2009-2010. This proves that simple technology, community involvement, and sustainable innovation can truly change lives and make a difference.